Shares of Apple rose nearly 3 percent Monday to close at a new all-time high of $411.63, padding the electronic giants lead over Exxon Mobile as the worlds most valuable company. 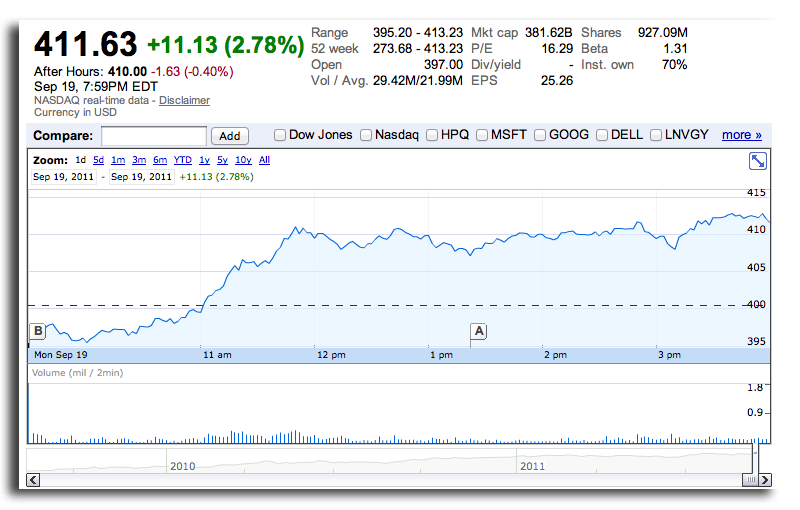 Apples previous high came on July 26 of this year when the stock hit $403.41 per share. With Mondays $11.13 gain, the Cupertino, Calif., iPhone maker retains its title as the worlds largest company by market capitalization, outpacing the former crown holder Exxon Mobil Corporation by $23 billion. Since Apple overtook the energy giant in August, its market cap has grown by more than $44 billion and now stands at $382.01 billion compared to Exxons $358.34 billion. Last quarter, Apple shipped a record 20.34 million iPhones, accounting for 46 percent of the companys revenue. One analyst recently told AppleInsider that Apple plans to build 30 million iPhone 5s in the fourth quarter of calendar 2011. Apples growth comes as U.S. markets took a moderate downturn Monday, due to investors shedding risky assets while Greek officials held a conference call with foreign creditors over their looming debt crisis, according to The New York Times.